Discussion on the Necessity and Problems of Applying 6S Management Mode in Enterprise Laboratory Zhang Jie;Wang Jiadong;Rong Shijia;Luo Menghua;Wang Zeqiang;Luo Chunmei;Guangxi Yinyi Advanced Material Co. Preparation of Graphene based Doped TiO_2 and Application in Treatment of Black and Odorous Water Bodies Tang Jing;Lin Changyuan;Liao Yong;Xie Hao;CRRC Shandong Co.
A Study of Landfill Expansion Project in Domestic Garbage Sanitary Landfill Site He Yaozhong;Guangdong Environmental Protection Engineering Research & Design Institute Co. The Analysis on the Treatment of Sludge in Municipal Wastewater Treatment Plant Nan Yanbin;Lei Kegang;Cheng Xiabing;He Ze;Chen Cuizhong;China City Planning Engineering Northwest Design Research Institute Co. Experimental Study of Treatment of Organic Wastewater by Advanced Oxidation Process of Sulfate Radicals Liao Haitao;Zhong Jie;Xin Canhui;Huang Zhenhao;Huizhou City Huiyang District Li Xing Environmental Protection Co.
Research Progress in the Resource Utilization of Landfill Leachate Mo Rusong;Zhongshan Environmental Protection Industrial Co.
Photocatalytic Purification of Organic Waste Gas in Chemistry Enterprise Laboratory Zhu Jianv;Chen Yuquan;Cai Shaoqing;Ma Lingli;Fan Liping;Liu Ying;Zhejiang Huaji Environmental Testing Co.
Dilemma and Solution for the Third Party Governance of Environmental Pollution in Pharmaceutical Enterprises——Case Analysis of the Third Party Governance of Pharmaceutical Wastewater Treatment Station Zhang Chuanbing;Yang Chuanzhong;Niu Ruisheng;Rong Zhongyuan;Xu Yahui;Huaxia Besince Environmental Technology Co.
EFDC-based Reconstruction Research of Lake Underwater Topography Li Dejun;Huang Longxiang;Xu Kun;Jian Zhuoyi;Wu Yihui;Huang Haiyu;Guangzhou Water Principle Environmental Remediation Co. Emergency Treatment Project of Water Quality Compliance of Wangjiangjing Section of Beijing-Hangzhou Grand Canal Deng Dongsheng;Shanghai FXAJ River Retreatment Co. Application of Zero Liquid Discharge Treatment Technology for Flue Gas Desulfurization Wastewater in Domestic Waste Incineration Plant Xiong Bin;Chen Gang;Li Qiang;Wang Ran;Gu Xiaozhe;Shen Zhen Energy Comprehensive Resource Development Co.
Surveillance on Aerobic Palte Count and Antibioti of Raw Milk in a District of Guangzhou You Bin;Li Danqi;Wu Ruibin;Guangzhou Inspection Testing and Certification Group Co.
Studies and Application on Recycling of Invalid Phosphoric Acid-Sulfuric Acid System Polishing Solution Li Weidong;Zhang Wenguang;Huang Zhenzong;Liu Zhiyi;Gao Yanting;Foshan Gaoming Kelang Environmental Technology Co. Compressor Selection Research Based on Integrity Management Li Shuguo;CNOOC Research Institute Co.
Design and Analysis of Mud Tank Based on Finite Element Method Li Ya;NHWOC Zhanjiang Survey and Design Co. Practice of Energy-saving Optimization and Transformation of Circulating Water System in Refinery Xu Guang;Production Technology Department Sinopec Beihai Refining and Chemical Co. Application of Work Load Assessment in Occupational Heath and Safety Management of Painting Tu Qunfeng;Coating and Molding Department Guangzhou Auto Toyota Automobile Co. 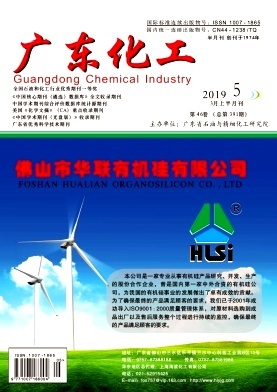 The Research of the Stability of Phycocyanin from Spirulina Platensis Lv Pingping;Li Chuanmao;Yang Dengliang;Lin Shengjie;Liu Dehai;Gongdong Danz group Co.
Synthesis and Properties of Waterborne Alkyd Resin Modified by Acrylic Ester Wang Pengfei;Foshan Gaoming TOD Chemical Industry Co. The Principle and Equipment Design of Hydrogen-Cyanide-Containing Exhaust Gas Treatment during the Manufacture of Carbon Fibers Cui Zhi;Yin Weitao;Xu Panpan;Qian Hongchuan;Guan Quanjing;Ma Yongtian;Jiansu Hengshen Co.
Studies of Phosphorus Flame Retardant NYP4 on the Flame-Retardancy Performance of PBT Zhu Wen;Chen Lin;Mo Wenjie;Li Jide;Li Kunquan;Chai Shengyong;KINGFA Science&Technology Co.
Study on the Performance Difference between Melting Ester-exchange PC and Phosgene PC Wang Peitao;Cen Yin;Ai Junwei;Tong Wei;Ding Chao;Kingfa Science and Technology Co. Effects of Compounding Resins on Mechanical Properties and Weather Resistance of ASA Alloys Fan Congcheng;Shanghai Kingfa Sci.& Tech.Dvpt.Co. The Study On Extraction,Purification and Antioxidative Activity of Polysaccharides From Allium Macrosttemon Bge Yang Nansong;Zhang Yu;Jiangsu Tianhe Pharmaceutical Co.
Simulation and Optimization of Phosgene Absorption Process in TDI Plant Liu Yaozong;Ma Jianjun;He Aixiao;Qi Shengming;Zhao Wei;Chang Zhilu;Jin Xiaorong;Wang Jianhua;Gansu Yinguang Juyin Chemical Co.
Development of Determination of Halogenated Carboxylic Acid Lu Chenchen;Jing Xiaoning;Yan Zhengyu;China Pharmaceutical University;Nanjing Cavendish Bio-engineering Technology Co.
Technical Reformation Measures for Improving Hydrogen Production Capacity Niu Tengjie;Zhaoqing Huanfa Biotechnology Co.
Hydrogen Production from Low Pressure Water Gas Process Sun Jun;Li Fanglue;Anhui Huadong Chemical and Medical Engineering Co.
Research Progress of Carbide Furnace Vent Gas purification Technology Zhang Lishu;Zhang Jie;Wei Guangjian;Sichuan Tianyi Science and Technology Co.